Yoshinoya is a fast food chain, started in 1899 in Tokyo. They serve gyūdon, a bowl of rice topped with thin slices of beef and onion simmered in a mildly sweet sauce. It grew to a chain of over 1200 restaurants in Japan and 700 outside of Japan (mostly China, but also more than 100 in the United States). In my search for old restaurants in Tokyo, I did not give that much thought to the plethora of chain restaurants until now. Little did I know that one of them has a very long history, even older than fast food restaurants in the Unites States. In all fairness, Yoshinoya as a chain only got started in 1968, while the US fast food history started in the 1920s. Fast food goes way back in Japan. The sushi we all love was one of the first types of fast food. The nigiri sushi type originated in the Japanese capital in the 1820s along the banks of the Sumida river and by the 1920s there were 100s of sushi carts in Tokyo. Yoshinoya as a restaurant did not aspire to become a fast food chain at the start. The first eatery opened in Nihombashi in Tokyo (later moved to Tsukiji). After almost 70 years, inspired by the American fast food boom, the second restaurant was opened in 1968 in Shimbashi and then quickly grew as the main gyūdon chain in Japan. 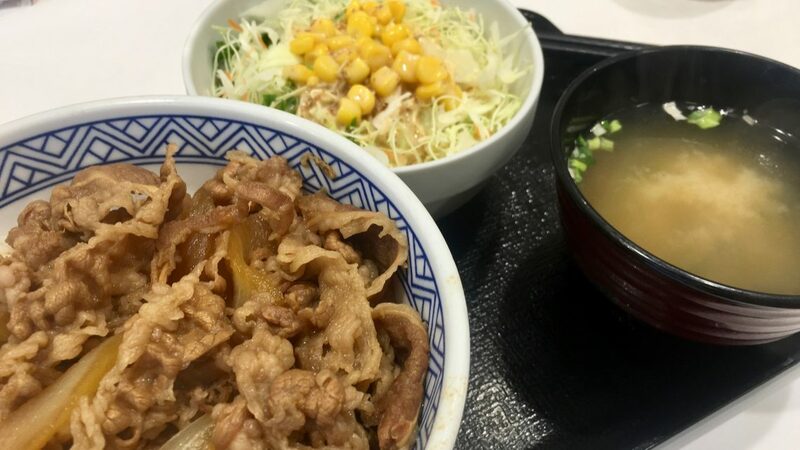 There are currently 3 major chains in Japan serving gyūdon: Sukiya (almost 2000 restaurants in Japan), Yoshinoya (1200+ restaurants) and Matsuya (1000+ restaurants). It seems everybody has their favorite, but I am actually not sure which one I prefer. I probably do not eat it enough to pick a clear winner. However, there is a distinct difference between the Yoshinoya restaurants in Japan and outside Japan. 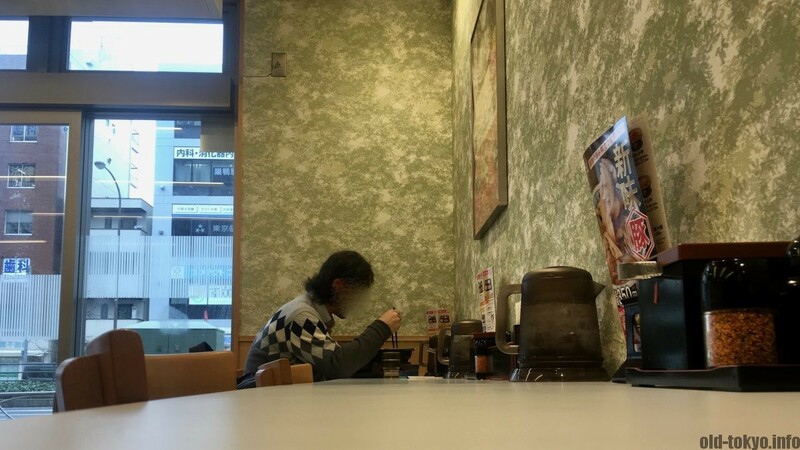 In Japan, this a paradise for the Japanese salary man: a quick meal for the hard working man (I hardly see woman in these restaurants). The restaurants are made for single customers, and you will almost never see a group of friends or a family having lunch or dinner here. I’ve never had someone suggest to go to Yoshinoya in all the years I live here. Outside of Japan Yoshinoya often has a more posh image as it is being branded as Japanese cuisine. The menu options inside Japan and outside Japan are also different, but the gyūdon is the same. Please note that I only have experience with Yoshinoya in Japan and Hong Kong. 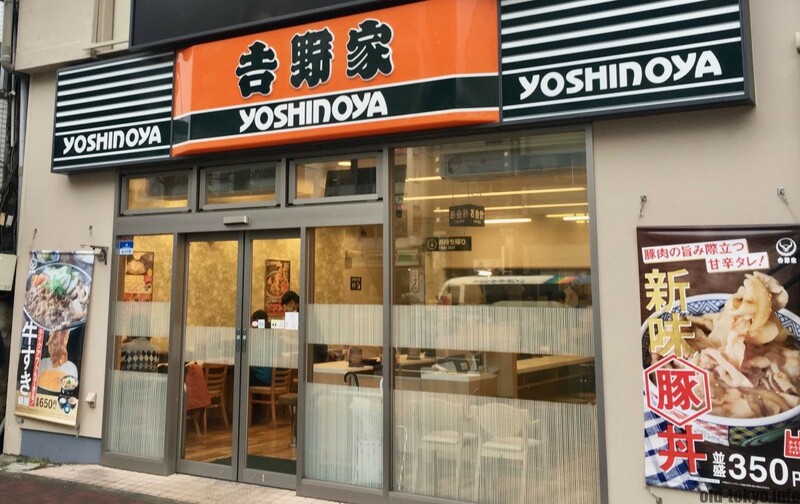 While you can go to an outlet in the Unites States or Hong Kong to get English service, Yoshinoya famously has limited English menus in Japan (they do exist though, in very touristic locations). For a place specialized in gyūdon there is quite a lot on the menu. 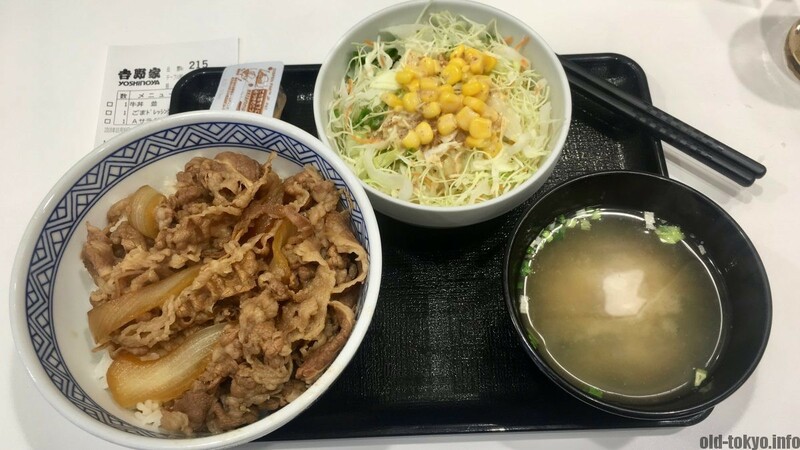 They have the same type of rice bowl not only with beef (the signature gyūdon), but also with pork (butadon), chicken (toridon), as well as curry dishes. Then they have several seasonal dishes. Recently they also seem to have eel (unajū), but not at all restaurants. A special morning menu is also available. You can order the rice bowls as apart of a set, they have 3 sets for the bowls, each set includes miso soup together with a salad (A menu), pickled vegetables (B menu) or kimchi (C menu). The bowls come in various sizes, regular is nami (669kcal), large is atama-no-ōmori (752kcal), very large is ōmori (929kcal) and extremely large is tokumori (1063kcal). 4. After you have finished, get the attention of the waiter/waitress again by shouting “sumimasen” and say “o-kaikei-kudasai” (the bill please). Your order is taken at your seat and you also pay at your seat. Do not visit during lunchtime in a business district on a weekday. Or please do, depending on the type of experience you are looking for. Entering one of these restaurants on a weekday during lunchtime feels a bit awkward though. You will be sitting amidst salaryman, all silent and in the same type of suit, devouring their gyūdon at a fast pace and leave. It is a side of Japan that I feel is a bit sad. But hey, you get a taste that is 119 years old!